Flat Panel Pros offers full-scale home theater design and home theater installation services, customized with all the controls and personalized programming to fit your needs. Our experienced technicians take a look at the area, listen to your needs, inventory the placement of the current outlets and wiring, and get to work drawing up a design that is just what you want. Our superior expertise and quality customer care are part of why we have a reputation as the go-to name for home theater design in Vancouver, WA. 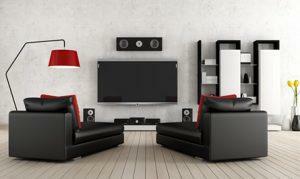 Home theaters are complicated to set up well, but should be easy to use. Our designs are made to look amazing, sound even better, and be completely user-friendly. We expertly integrate your devices and program the entire automation, then we teach you how to use it. You will be a pro on the system by the time we leave. And it is all probably less expensive than you think! From installing hidden, customized surround sound speakers to mounting your flat panel TV, we create a home theater that is as visually appealing as it delivers on quality sound. We walk you through all the options available in the latest technology, letting you select the features that you want. Your multimedia center will be smart and easy to use. We utilize the latest smart TV technology and integration of devices and programming like Amazon Prime Videos, Netflix, and Hulu. You will feel the impact of your custom theater experience. Call today and talk to us about what you have in mind for your home theater design in Vancouver, WA or the surrounding metro area.